The rapid growth in demand for animal-based foods and fresh produce and the intensification of agriculture to meet this growing demand are serious concerns for preventing foodborne illnesses. According to 2015 World Health Organization (WHO) estimates, foodborne illnesses are making 600 million people ill and killing 420,000 people per year worldwide. Also, foodborne incidents can significantly reduce sales of large food companies. For example, sales for Chipotle restaurants fell 30 percent in December 2015 compared to 2014 after a few food safety incidents. International organizations (such as the WHO) are working across the globe to ensure safer food for everyone, everywhere. However, the lack of available information, or data, to the food industry, policy makers, and consumers can greatly deter the ability to prevent foodborne diseases. Big data can provide timely and innovative solutions to the food safety issues. Big data provide a technological breakthrough that can help the public and private sector to develop suitable measures and sustainably improve the food safety system. Food safety agencies are using big data tools including social media (Facebook, Twitter, YouTube, etc.) to communicate with the general public. Food agencies may detect new food safety issues by interacting with the public (consumers) through social media; the CDC indicated that using social media-related information such as Yelp reviews can allow for early detection of foodborne outbreaks. There are many definitions for big data; the WHO defines big data as “emerging use of rapidly collected, complex data in such unprecedented quantities that terabytes, petabytes or even zettabytes of storage may be required; the unique properties of big data are defined by four dimensions: volume, velocity, variety and veracity”. Big data can be generated by sensors, mobile apps, digital devices, IoT (Internet of Things), etc. 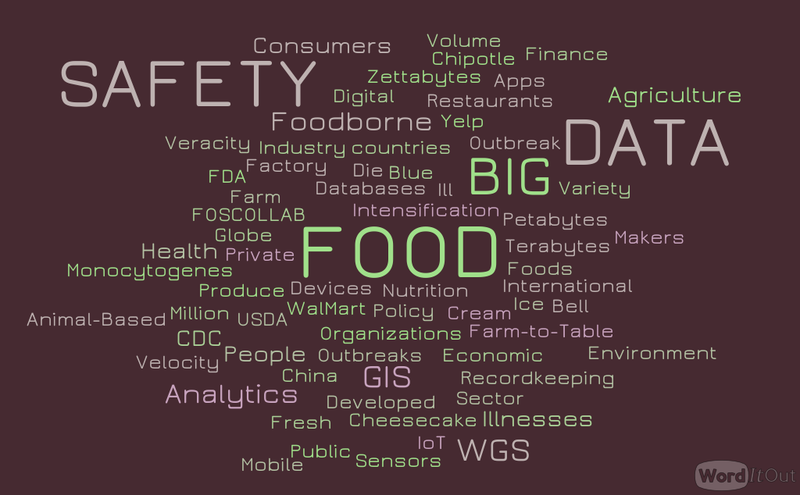 Big data can also be successfully applied to food safety because food safety data and information are connected to many sectors including agriculture, food, environment, nutrition, health, social, economic, etc. The WHO recognizes the value of big data and has embraced the use of the big data approach through the global platform for food safety data and information FOSCOLLAB to enhance insight and subsequently result in better decision-making regarding food safety issues. The use of big data generated by whole genome sequencing (WGS) is a new trend to ensure food safety. The WGS-based subtyping has been recently used to create large sets of data which can be used for high resolution subtype characterization of foodborne pathogens which allows for higher accuracy and faster pathogen/outbreak detection. The rapid release of WGS data allows the food industry to react faster. The CDC, FDA, the USDA-FSIS as well as other international public health organizations have already begun sequencing foodborne pathogen isolates. WGS was used to confirm the link between the food/facility isolates and those derived from clinical cases in the U.S. producer of a Mexican-style cheese associated with L. monocytogenes in 2014. WGS was also used to detect Listeria monocytogene associated with the Blue Bell ice cream outbreak in 2015. Tracing food is mandatory to ensure quick recalls which can be done using sensor-based technologies where near or real-time data can be collected. For example, the Cheesecake Factory collects large volumes of data on transportation temperature where affected food can quickly be recalled. Walmart uses a Sustainable Paperless Auditing and Record Keeping (SPARK) system that automatically uploads data such as cooking temperature to a web-based recordkeeping system where millions of data entries can be generated which can be used to quickly identify uncooked chicken. There is a huge value in using other larger data sets and frameworks, in addition to the data sets specifically generated for food safety applications. One example is the use of geographical information systems (GIS), a system used for capturing, storing, manipulating, and spatial or geographic data to identify or predict where pre-harvest food safety hazards associated with specific food and environments have, or are likely to occur. Consumers can also use big data to educate themselves about foodborne diseases by searching the internet. Several developed countries around the globe have adopted the big data approach; the European Commission has developed a strategy on big data which supports open access of data including European Union-funded research results, scientific publications, among other initiatives; the Obama Administration launched a Big Data Research and Development Initiative in the United States; and, private companies, academia, and local governments are also now collaborating on big data projects. Developing countries, with the support of developed countries, should follow in the steps of developed countries and international organizations by adopting and implementing big data approaches to address food safety issues. Donor programs should provide more support on creating international databases (farm-to-table databases) to trace back food from fork to farm and to build the capacity of developing countries to establish and manage food safety programs. China, through its Beijing Municipal Commission of Commerce, planned to incorporate big data into the food industry in order to improve safety standards.